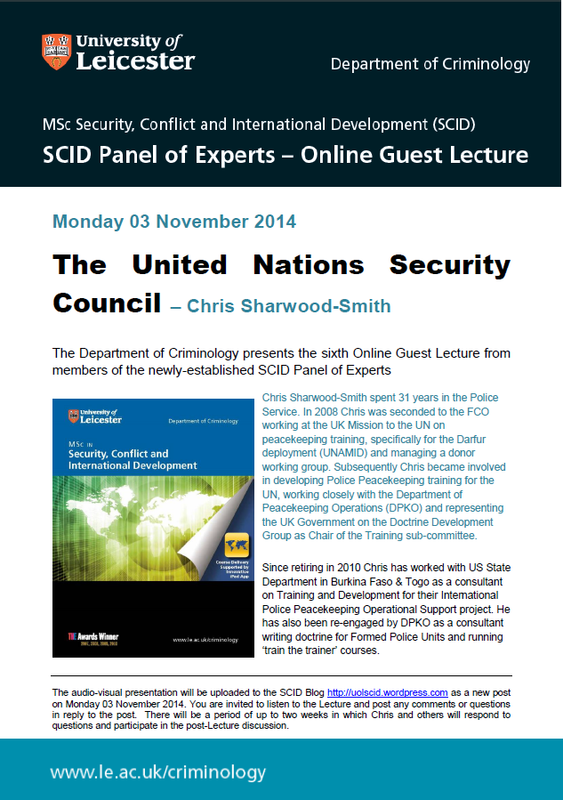 Below are bi-monthly Online Guest Lectures by members of the SCID Panel of Experts which were delivered 2013-2016 on a range of subjects related to security, conflict and international development. Each lecture was followed by a period of two weeks in which the Expert who delivered the lecture responded to questions and discussed issues raised – along with other SCID Panel members, students and staff. NB Should any of the presentations not run automatically or the audio not work, please click ‘Save As’ (and then open once you have saved on your computer) rather than ‘Open’ when you click on the presentation. Alternatively try a different browser (Firefox rather than Internet Explorer). 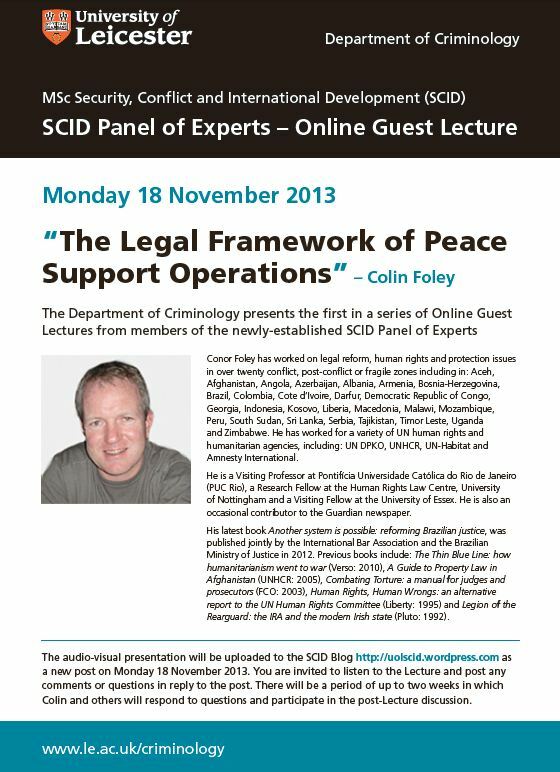 Conor Foley presents the first Online Guest Lecture. He discusses the legal aspects of Peace Support Operations (PSOs) by considering the relevant bodies of law in peacekeeping, principally: the UN Charter and UN Security Council Resolutions; International Humanitarian Law (IHL); International Human Rights Law; Refugee Law; Host state law; and the State of Forces Agreements (SOPAs). Conor’s Lecture concludes by reflecting upon the issues of peacekeeper accountability and the principle of immunity, before reflecting upon the UN Human Rights Due Diligence policy. Click on the link below to access Conor’s Lecture (it is large so it will take a while to download). 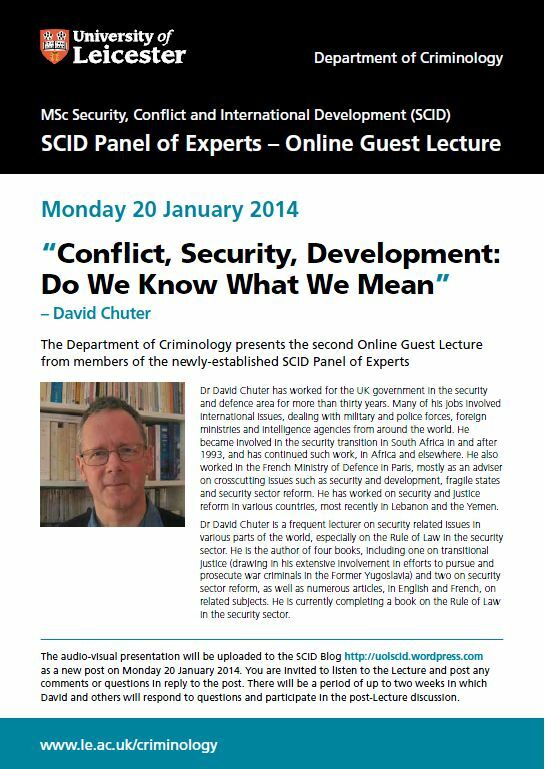 Second Online Guest Lecture – Dr David Chuter – Conflict, Security, Development – Do We Know What We Mean? 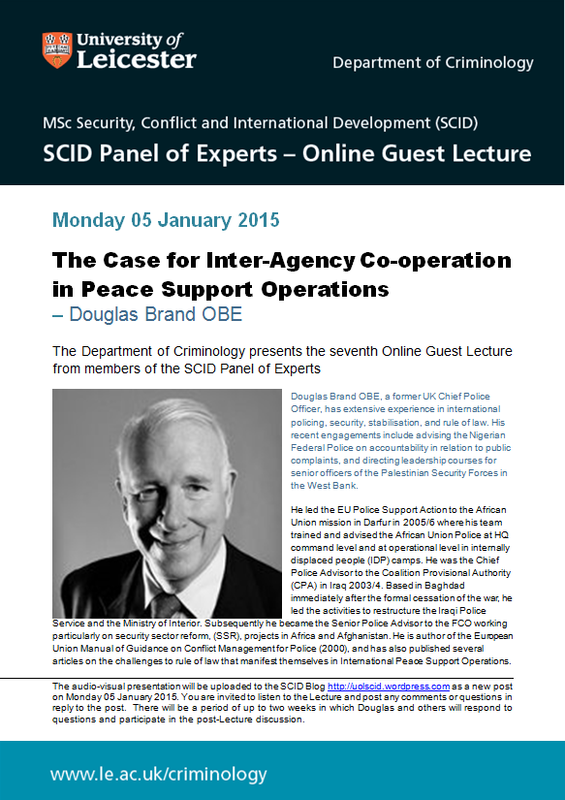 This is the second Online Guest Lecture by members of the SCID Panel of Experts. Dr David Chuter presents a lecture entitled ‘Conflict, Security and Development: Do We Know What We Mean?’. The main theme of the lecture is that security, conflict and development can be seen as a struggle between discourses to impose a normative view, and to mark out political territory on behalf of governments, donors, international organisations and other interested actors. This leads to a high degree of confusion on the ground, as different interest groups battle to impose a view of what the particular crisis is “about”, with none of them able to dominate totally. Drawing on Gramsci and Foucault, in the first half of David’s lecture it is argued that this helps to explain the inconsistency and confusion of donor approaches, both within and between crises. The second half of the lecture focuses on the application of the concepts in practice, endeavouring to identify the main contradictions and uncertainties of donor approaches and explain where they come from. Click on the link below to access David’s Lecture (it is large so it will take a while to download). 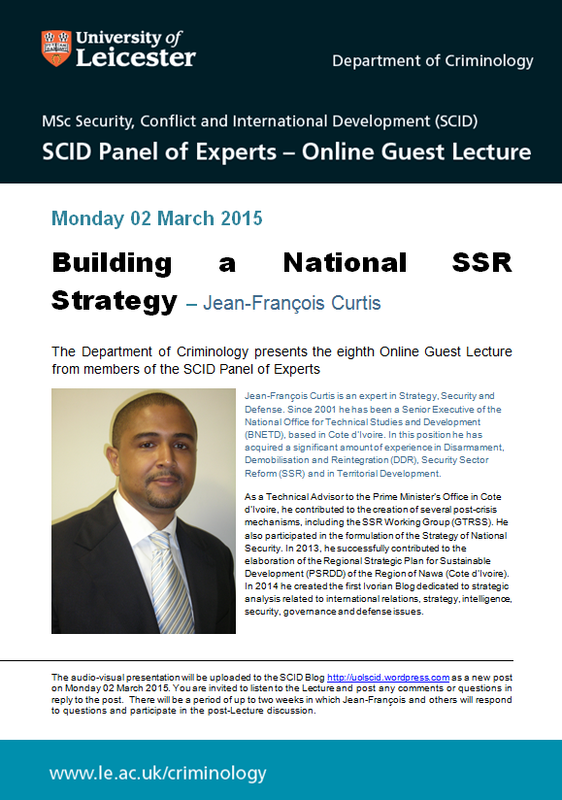 This is the third Online Guest Lecture by members of the SCID Panel of Experts. 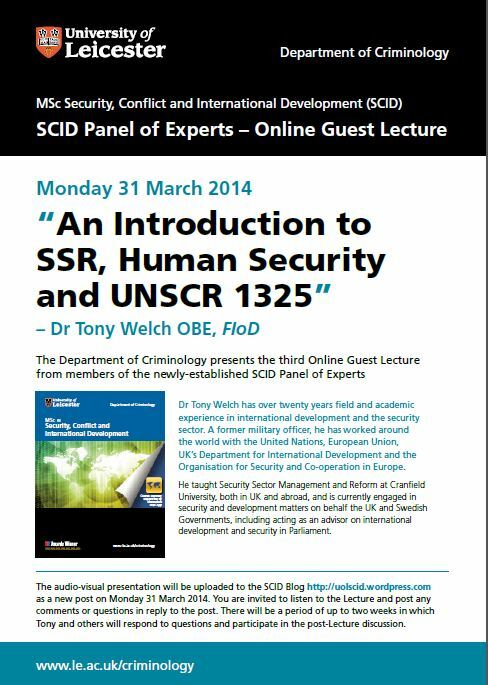 Dr Tony Welch OBE presents a lecture entitled ‘An Introduction to SSR, Human Security and UNSCR 1325′. A balance between security institution building and civil society development is necessary for creating effective interaction and cooperation between them. Effective national security cannot be developed without the ability of women in civil society to participate in the process. This must include the involvement of women at all levels. It is only through the involvement of Women’s Groups and women at high level in International and Inter Governmental Organisations, working alongside their male colleagues, will be possible to implement the concept of civil security and an integrated and holistic security sector. Click on the link below to access Tony’s Lecture (it is large so it will take a while to download). The lecture engages with the military doctrinal and academic debate over the latest 25 years on peacekeeping, peace support operations (PSO) and the use of force, specifically addressing issues concerning the relationship between the use of force and the peacekeeping principles of consent and impartiality; the political consequences for achievement of the mission of the use of force or non use of force; issues of reality, practicality and the professionalism of the peacekeeping forces, specifically concerning whether those deployed are able to use force judiciously; and the responsibility to protect (R2P) people from genocide, war crimes, crimes against humanity, and ethnic cleansing. The lecture then compares and contrasts PSO doctrine with counter insurgency (COIN) doctrine. 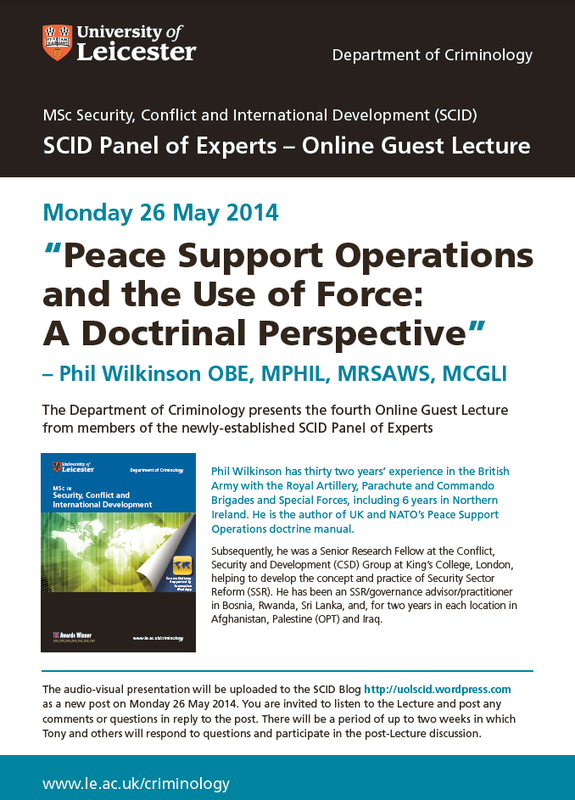 The lecture draws upon Phil’s extensive practical experience, particularly being largely responsible for drawing up the PSO doctrine for the UK, NATO and the UK. Click on the link below to access Phil’s Lecture (it is large so it will take a while to download). States used to be reluctant to take action inside the sovereign territory of another state unless they were at war with them, but it has now become an accepted international norm that there is a responsibility to protect civilians from excessive risk and to intervene where armed conflict crosses a certain threshold of acceptability. Various international devices are used to legitimise such interventions and a rapid evolution has occurred in the past ten years since the Iraq intervention, that sees a more sophisticated and subtle approach. But still old problems remain. Intervening states assume primacy in much the same way they would have done had they been victors in a war. The perspective of the intervening state tends to lead the direction and high pace of the intervention, particularly in the early stabilisation phase as armed conflict starts to recede. The overall direction of transition is dictated by the intervening state’s world view but intervening states are not unitary actors and there are often, even with joint analysis and an integrated approach, conflicting claims and priorities between different parts of a state’s intervention apparatus and policy streams. This creates tensions and synergies which mask underlying problems of whether the planned and assumed intervention outcome is suitable, sustainable and sovereign in reflecting the views, needs and culture of the state in which the intervention takes place. The rivalry between different aspects of the intervention and the assumption of the intervener’s values taking primacy and being appropriate to the needs of the local situation divert attention from true impact of the intervention. This is likely to result in unintended outcomes. 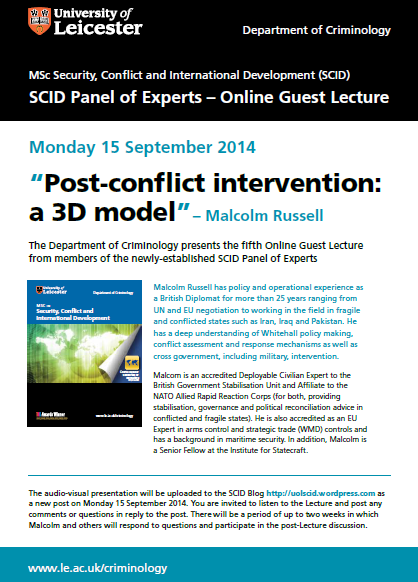 This lecture takes a 3D look at what this stabilisation phase of a post armed conflict intervention comprises and highlights some of these issues. This lecture also builds upon some of the issues and themes developed in Malcolm’s Symposium presentation – you can watch and listen to this presentation on this Blog (and in the SCID Course materials) and also read his paper in the recently published Reader, also available on this Blog and in the course materials. Click on the link below to access Malcolm’s Lecture (it is large so it will take a while to download). This Lecture addresses what the UN Security Council (UNSC) does in theory and in practice, including its historical context and methods of operation. It then considers various arguments and proposals for UNSC reform, and how various reform proposals have been responded to, before assessing the likelihood of reform in the near future. Click on the link below to access Chris’ Lecture (it is large so it will take a while to download). This lecture presents the case for inter-agency co-operation in Peace Support Operations (PSOs), particularly in light of the absence of willingness for co-operation despite general agreement that co-operation is necessary. The lecture considers impediments to successful co-operation and how co-operation can best be facilitated by looking at examples from Iraq, Darfur and Palestine and by reflecting upon lessons identified and lessons learned. Click on the link below to access Douglas’ Lecture (it is large so it will take a while to download). Once you open the PowerPoint presentation, you will have to click on ‘Slide Show’ (at the top of the screen) then ‘From Beginning’ (top left) to listen to the presentation. Please submit any questions or comments within the next two weeks for Douglas’ attention and/or discussion by other SCID Panel members, students and staff. The lecture engages with the issue of building a national SSR strategy based on the Ivorian example, specifically addressing the major definitions of SSR, the historical background of the crisis in Côte d’Ivoire, the description of the SSR strategy that was carried out and finally the lessons learned from that SSR process. The idea is to share the weaknesses and strengths of the Ivorian ongoing experience with SSR and provide lessons that could be useful for SSR programmes being implemented in other post-conflict environments. There are multiple examples of SSR strategies in many contexts and this lecture does not aim to fulfil the impossible task of covering all the issues and problems related to SSR. Instead the lecture gives an insight of what implementing an SSR strategy in an African French-speaking country is like. Click on the link below to access Jean-François’ Lecture (it is large so it will take a while to download). Please submit any questions or comments within the next two weeks for Jean-François’ attention and/or discussion by other SCID Panel members, students and staff. 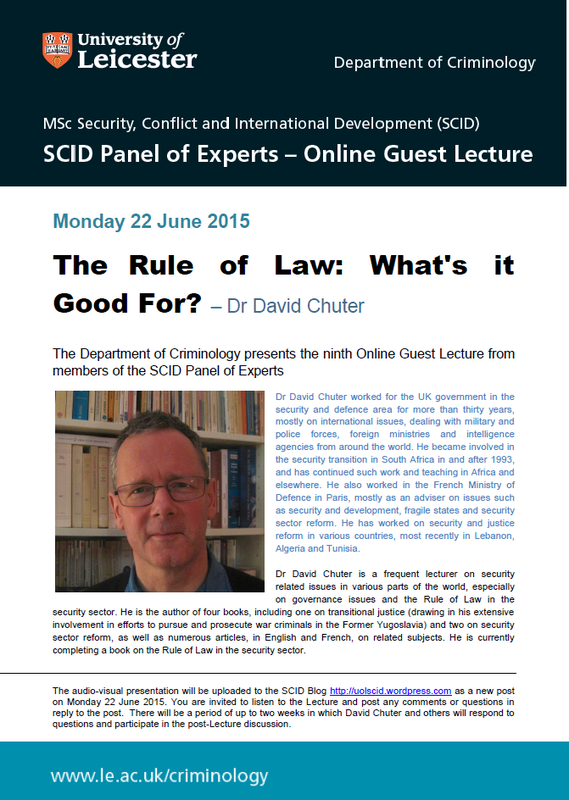 Ninth Online Guest Lecture – Dr David Chuter – The Rule of Law: What’s it Good For? The complicated and frequently contradictory discourse surrounding what is often called the “Rule of Law” tends to conceal an issue of great political importance: the relationship between the state and the people, and how the state chooses to enforce (or not) the peoples’ norms and standards. This Lecture focuses on the rather different norms and traditions which are uneasily combined in the concept of the “Rule of Law”, and the practical difficulties involved in trying to apply that concept, in Western societies as much as elsewhere. This Lecture will be an essential resource for SCID students in its discussion of the rule of law, how it is variously defined and understood and, essentially, the relationship between the state and its citizens. Moreover, its importance lies in encouraging a critical reflection upon the amorphous and often ambiguous terms frequently used with the field of post-conflict intervention (rule of law, governance, development and so on). Click on the link below to access David’s Lecture (it is large so it will take a while to download). Please submit any questions or comments within the next two weeks for David’s attention and/or discussion by other SCID Panel members, students and staff. 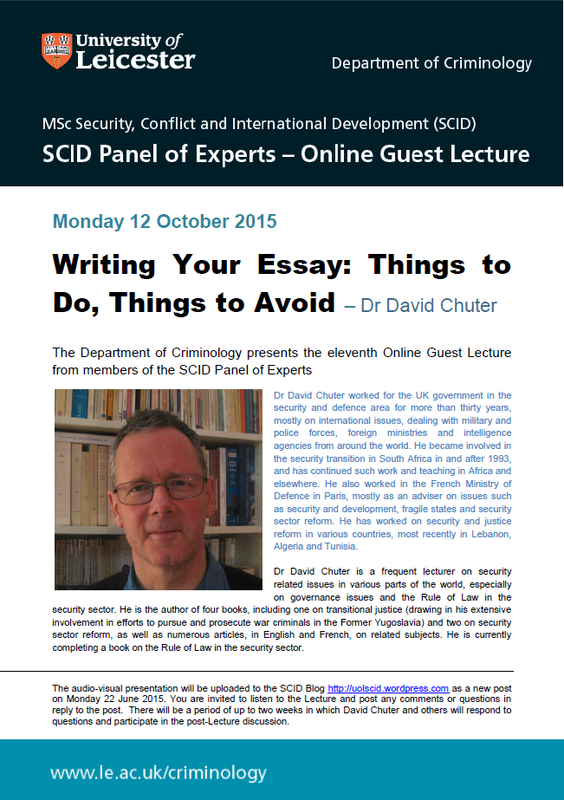 David’s lecture will be enormously useful to all SCID students when planning, writing and reflecting on feedback on their essays. David provides advice and guidance on how to write an essay with a strong structure, containing a persuasive and logical argument, that responds to the expectations of the University, and which is appropriate in its content, tone and style. 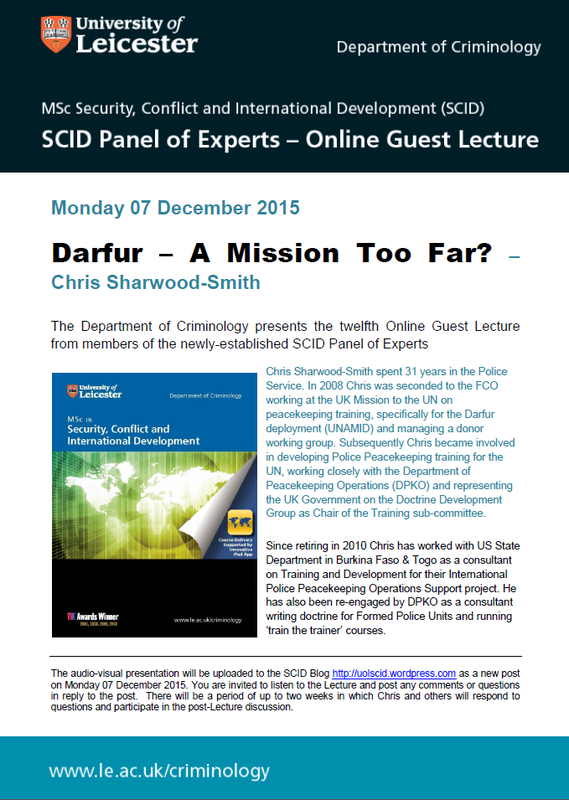 Twelfth Online Guest Lecture – Mr Chris Sharwood-Smith – Darfur: A Mission Too Far? Chris’ lecture looks at some of the major factors which affected the initial UNAMID deployment as it transitioned from an African Union deployment of 6,000 to an African Union/United Nations hybrid of massive proportions. It examines some of the reasons why there was widespread global criticism for the time it took to get the UN boots on the ground, and how, perhaps, the initial deployment authorised by the UN Security Council was never likely to be achieved. Click on the link below to access Chris’ Lecture (it is large so it will take a while to download). Please submit any questions or comments within the next two weeks for Chris’ attention and/or discussion by other SCID Panel members, students and staff. Punam’s lecture considers the impact of armed conflict on women, with specific regard to the lived experiences of women in Nepal. The lecture also looks at the changing role of women after the recent conflict in Nepal and concludes that despite sufferings and hardships, women have benefited from the civil war in Nepal. The lecture also argues that programmes to support post-conflict societies need to focus on the emerging needs of people, not just on a narrow definition of recovery – as can been seen when looking at the case of women in post-conflict Nepal. Punam is a new member of the SCID Panel of Experts and is currently a Visiting Scholar at the new Centre for Women, Peace and Security at the London School of Economics (LSE). Punam has conducted research widely in the field of gender, peace and security, and her book Social Transformation in Post Conflict Nepal: A Gender Perspective is being published by Routledge in May (2016). Fourteenth Online Guest Lecture – Steven Smith MBE – The Global Humanitarian Harm from Improvised Explosive Devices (IEDs). I would like to address my comments to you. First I acknowledge that you have thrown in very useful insights into the debate on Security, conflict and development nexus. You leave your audience in no doubt as to the “grey” nature of the literature and the apparent lack of consensus even amongst actors on acceptable universal definition of some of the concepts. I accept your submission that Security, Conflict and Development are replete with overlapping themes, inconsistencies and competing discusses, not least due to the competing international and local actors. However, there are a few adverse comments I would like to add, nothing personal but the intention here is to give greater clarity and better learning experience. Firstly, I would like to debunk your categorical assumption that “Armed Conflict are things started by people not like us in small countries far away”. Indeed contemporary armed conflicts seem more prevalent in weak and fragile states (not necessarily small states in terms of geographical spread or population), but the dynamic factors of causation and of course the subsequent effect of such conflicts almost always assume international dimension. For example, in terms of causes of armed conflict, some civil wars in Africa are a direct consequence of the incongruence between State boundaries, and the distribution of ethnic/ religious groups – a legacy of colonial enterprise, made for colonial convenience. There are also examples of imperial powers promoting internal rivalries or incursions into local political space in order to concretize a better grip and influence on the internal affairs of the host nation. For example, the 1953 Iranian Coup d’état orchestrated by the British and American under the code-name “Operation Boot”. Again, empirical evidence suggests that conflict in one country has the potential of cross-border dimension. Therefore it becomes a global concern. Its not so far away after all. In the light of the above, I am inclined to dismiss the assumption that conflict is caused by people in small countries far away from us. My second comment focuses on the development and security nexus. In dismissing Kofi Annan’s suggestion that “…we will not enjoy development without security, we will not enjoy security without development…”, you suggested that there are historic evidences to support that development depends on security, but security does not depend on development. While I am inclined to accept that development depends on security, I am unable to agree with you that security does not depend on development because in post conflict environment, the interaction between security, justice and development are intricately dynamic. They are mutually reinforcing. Security will continue to be threatened as long as development is lacking. Development enhances security. Infrastructure development, institution building, human capital development are all within the remit of Development. The presence or absence of these impact security positively or negatively. Thank you for your comments. In the first case, I fear I am to blame for misleading you. What I was trying to say was that, if you look at the literature, most of what is said about conflict, or armed conflict, concentrates on precisely the kind of small wars or domestic conflicts which, as you rightly say, are not necessarily typical and certainly not exclusive. Thus, the picture which emerges from the literature on CSD is very far from the reality either of what causes wars, or the nature of wars themselves. This is part of the discourse I was criticizing – not that armed conflict is actually caused by people not like us far away, but rather that our norms and discourse, and the way that conflict is represented in the literature implies that it is. In fact, whatever you think of the most destructive wars of modern times – Iraq and Afghanistan – it cannot be denied that both were started by the West. I therefore agree with your point and I’m sorry if what I said did not come over very clearly. On the other point, I think we have to agree to differ, bearing in mind that, as I said in the lecture, you can define development and security in many ways, and some combinations can make it look as though development brings about security. But whilst there are lots of examples of security permitting development (though the relationship is not automatic) I can’t think of any actual examples of where development has been shown to promote security, though I can think of many where it has resulted in insecurity. But perhaps you can.